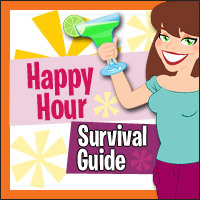 HG's All-New Happy Hour Survival Guide! Out-on-the-Town Happy Hour DOs and DON'Ts! DO grab a light beer or a glass of wine. 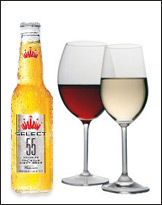 A bottle of light beer has around 100 calories (some have as few as 55! ), and a 5-oz. glass of wine has about 120 calories. Pretty reasonable! Plus, it's easier to estimate your caloric intake with these than with mysterious mixed cocktails. DON'T go overboard with the bar bites. Those items are often fried, fatty, and carby. So don't skip dinner in an effort to save your calories for drinks -- if you do, you're likely to gobble down too many of those calorific chews. If you've gotta nosh during happy hour, opt for something light like shrimp cocktail or not-too-saucy chicken skewers. DO stick to clear or light-colored alcohols! These have about 100 calories per 1.5-oz. shot. Vodka, rum, tequila... All good choices. A one-shot drink over ice with a calorie-free mixer and a squeeze of lemon or lime is a nice refreshing way to go! DON'T get a drink that looks like a dessert. Creamy, sweet beverages can be loaded with ice cream, syrups, and more alcohol than you might think. Not only can you get more tipsy than you intend (making those fatty bar bites harder to resist! ), but you can also end up slurping an entire meal's worth of calories. DO pick club soda over tonic water. Club soda (a.k.a. soda water) has no calories, while tonic water has about 80 calories per cup! Ridiculous, right? Diet soda of any sort also makes for a great zero-calorie mixer. DON'T forget about the calories in fruit juice! A splash for flavor is OK, but a half-cup can add around 60 calories to your beverage. DO SOCIALIZE! The more time you spend gabbing, the less time food and drinks are going into your mouth. Throwing a party? Having a get-together or girls' night? Make sure you have the right tools to whip up smart sips all night long! 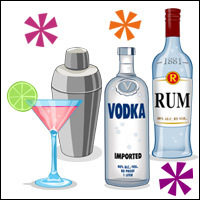 Liquor essentials - Vodka, rum, and tequila are good basics, and flavored varieties can be fun ways to amp up your drinks. Orange-flavored vodka? Yes, please! Passion fruit rum? Heck, yeah! 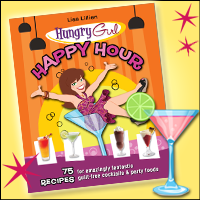 No-calorie and low-calorie mixers - Club soda, diet cola (we like Coke Zero), diet lemon-lime soda (Sprite Zero rules! ), light juice drinks (Trop50 has many flavors), and sugar-free powdered drink mixes (duh, Crystal Light) are at the top of our list. Ice - We can't emphasize how important it is to have good ice. Boo to freezer burn! If you have one of those refrigerators that dispenses crushed ice, SCORE! You are one lucky duck. Fruit - Whether fresh, canned (in juice), or frozen (without added sweeteners), fruit is good to keep on hand for making blended beverages and garnishing mixed drinks. Bar tools - We keep it simple: a jigger (to measure shots), a measuring cup with ounce markings (to measure mixers), a shaker, a blender, glasses, and bendy straws! HG FYI! Are you confused about the right way to calculate the PointsPlus® values for alcoholic beverages? You're not alone. Click here for the full info! Save your pals from sad happy hours -- click "Send to a Friend" STAT! It's here again -- July 22nd, National Penuche Day. Penuche is a fudge-like treat made with brown sugar, butter, milk, vanilla, and (sometimes) nuts. We'll be penuche-ish and eat Quaker Lower Sugar Instant Oatmeal in the Maple & Brown Sugar flavor and crumble some pecans on top.